Roughly 200 kilometers (125 miles) east of Toronto, Ontario’s Prince Edward County is a popular destination for a weekend getaway, with more than two dozen wineries, a growing number of first-rate restaurants and art galleries, long, sandy beaches, and even a mysterious lake. 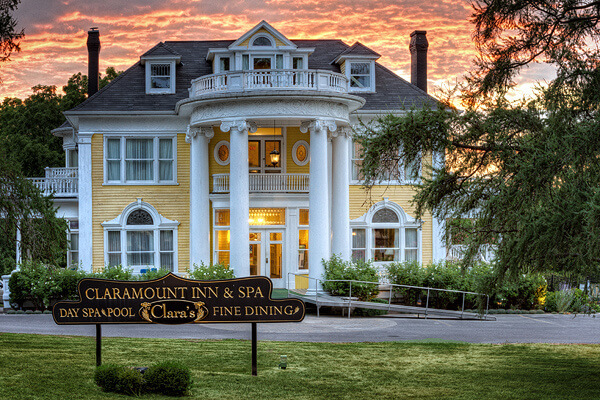 And if you’re planning that getaway with a special someone, a good choice for romantic accommodations is the Claramount Inn and Spa. Built in the early 1900s as a private home — the owner named the mansion for his wife, Clara — this stately Greek Revival inn is located in Picton, the County’s largest town, so it’s handy for dining and exploring (although nothing in the County is that far from anything else). I’d recommend booking one of the seven spacious suites in the main inn, which are all traditionally furnished with antiques and period pieces. The three suites in the adjacent carriage house are fine, but more rustic country-pine and far less posh. I stayed in the red-and-gold Room 1, right by the front entrance. The sitting area has two wing chairs next to the original (but non-working) fireplace, a writing desk in front of the windows, and an armoire. 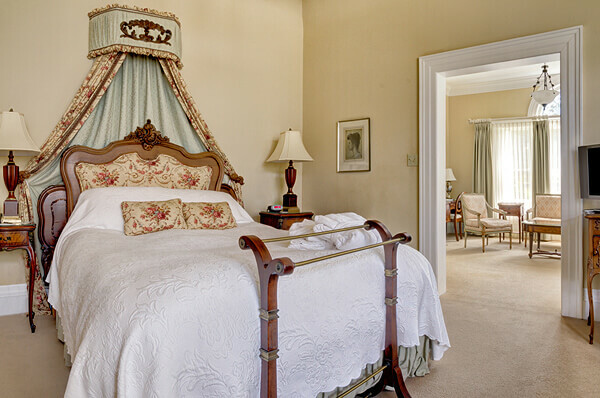 On the other side of the room, a carved, four-poster bed sits beneath a stained glass window. 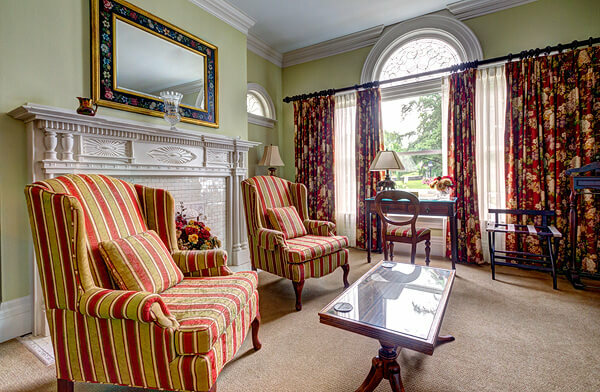 Modern amenities include Wi-Fi and a flat-screen TV. Two people could easily lounge around in the big bathroom, with its deep whirlpool tub, separate shower, and toilet enclosed in its own cubby-room. My only complaint is that I could hear (albeit faintly) the comings and goings in the front hall, just outside my door. Double rates range from CAD$195 to $225 per night. The more expensive rooms, like Room 2, pictured above, have separate sitting and sleeping areas. On the main floor overlooking the lawns, trees, and gardens, Clara’s Restaurant offers a seasonally-changing menu of contemporary fare. Like many County dining rooms, Clara’s tries to source ingredients locally whenever possible. Local produce, Ontario cheeses, and fish, like Lake Ontario pickerel, make frequent appearances on the menu. Although the basic room rates don’t include meals, packages are available that include breakfast or both breakfast and dinner. 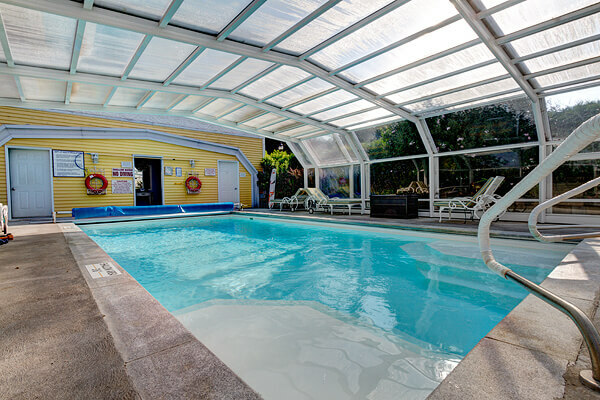 Adjacent to the inn is a heated saltwater pool where guests can swim year-round; its retractable roof opens to the air in the mild weather. An outdoor hot tub is a summer amenity. The inn’s lower level houses a small spa, with a steam room and infrared sauna. The spa offers various forms of hydrotherapy in its Vichy shower room, and it claims to be one of the few spas in Canada to provide Hawaiian lomi lomi massage. Guys can opt for a Beer Pedicure (yes, really! ), which uses a by-product from the beer-making process at the nearby Barley Days Brewery to help make your feet soft and smooth. Hotel review by Vancouver-based travel, food, and feature writer Carolyn B. Heller, author of the new travel guide, Moon Handbooks: Ontario, which features fun and funky attractions and experiences, lodgings, and places to eat across the province. Photos courtesy of the Claramount Inn & Spa. The Claramount Inn hosted my stay for review purposes.